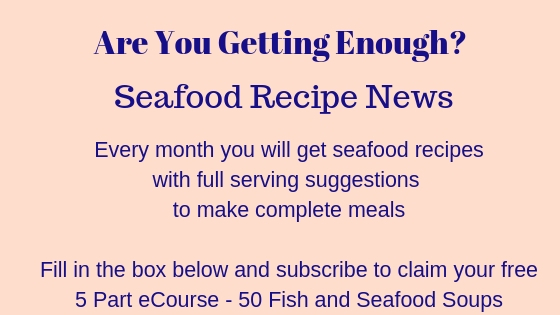 This is one of my best and most adaptable baked fish with sauce recipes and there are more linked at the bottom of this page. You can use any type of firm fish you like. 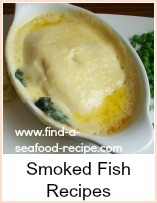 The basic recipe calls for white fish fillet, such as cod or haddock. 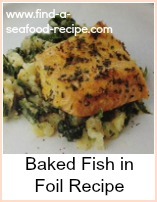 You could have a mixture of fish, smoked and plain or chop up some salmon or even open a can of salmon. It's cooked in sauce, covered in breadcrumbs and baked in the oven - super simple! The sauce method is via a link to a page giving three methods of making the sauce - traditional, all in one or blender. Also, you could use parsley instead of the cheese or just a white sauce. Crumb your bread in the blender and put into a bowl - mix in the parmesan cheese. Cut the fish into good sized chunks and put in the bottom of a greased ovenproof dish. Season with salt and pepper. Make your sauce according to the instructions here. Pour the hot sauce over the fish. Tip the breadcrumbs over the fish and sauce mixture and spread them out evenly, then drizzle with olive oil. Bake in the oven for about 25 minutes until the top is nice and crispy. Serve with boiled potatoes, a selection of vegetables or crusty bread. 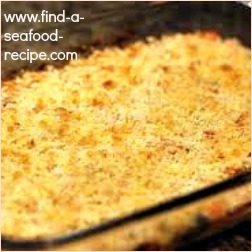 The topping in this case is breadcrumbs mixed with parmesan which gives a lovely crunchy finish 'au gratin', but you could use cooked sliced potatoes or mash (creamed) as the topping. Or you could leave out the parmesan and use ordinary grated cheese - you'll need about 1 Cup, 6 oz (150g) of cheese as parmesan is quite strong so only 2 oz (50g) is necessary. Or you could add chopped parsley or dill. With a mashed potato topping, you've got a Fisherman's Pie - bit like a cottage pie or shepherd's pie but with fish - it's great nursery food and a good way of getting children to eat fish. Just make sure you remove all the bones during preparation. You can do this at the time you're cutting into chunks - run your fingers over each piece and remove any bones you find. 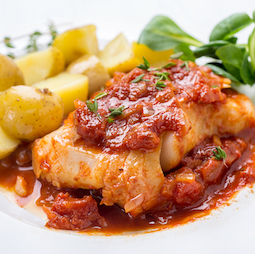 Simplicity itself :-) and versatile - the only limit is your imagination in baked fish with sauce recipes. This quantity of fish will feed three to four people, depending on their appetites. 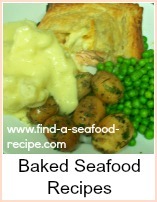 A very easy baked white fish with a cheese sauce and breadcrumb topping. Super simple to make and very tasty.